This past June 14 marked the first anniversary of the Grenfell Tower fire in London, England, that blaze was one of the most tragic fires in the history of the modern United Kingdom. Seventy-two people died and more than 70 were injured. Two units respond to alarm bells at a school after a caretaker reports a suspected gas leak. The local gas company is on the scene and refuses to enter the building due to elevated lower explosive limit (LEL) readings. The ladder crew begins to investigate with a multi-gas detector. 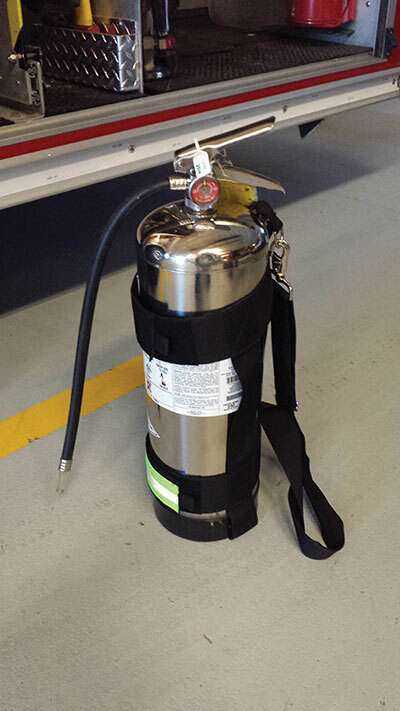 The portable fire extinguisher is one of the most undervalued tools in the fire service. Every fire truck is equipped with at least one of these devices, and many trucks carry a variety of extinguishers. Photo 1: The majority of portable fire extinguishers found on apparatuses are dry-chemical ABC multipurpose devices. Photo 2: On Class-B or C fires (flammable liquid and gas) a dry-chemical extinguisher is the choice tool to use. Photo 3: A water extinguisher or water can is considered standard equipment on a dedicated truck company. Photo 4: A firefighter can control nozzle discharge pattern of a water extinguisher by using a finger or thumb. Portable extinguishers are usually found at constructions sites and at several locations in industrial buildings. The industrial units vary in size according to need and application, from 10-pound units to extinguishers that require a wheel cart to move around. Municipal firefighters do not often encounter the large, wheeled extinguishers, but it is important to know the types of extinguishers and their uses; it is important, however, for all firefighters to be proficient in the use of 10-pound, 20-pound and even 30-pound extinguishers. The majority of portable fire extinguishers found on trucks are dry-chemical ABC multipurpose devices (see photo 1). These are great tools for suppressing Class-A, Class-B or even Class-C fires, inside or outside a dwelling. These small extinguishers are good tools to carry into calls for smoke in a building, a pot on the stove, an alarm sounding with nothing showing, or calls at which there may be a small fire that would require a quick and easy knockdown. The downside to dry-chemical extinguishers is that they are messy when discharged and leave a chemical spill to be cleaned up by the resident or building owner after the small fire has been suppressed. This factor should be considered when deciding between a dry-chemical extinguisher or a water can. 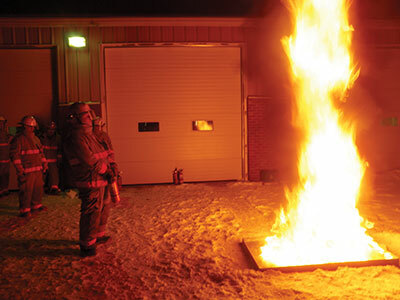 On a Class-B fire (see photo 2) or a Class-C fire, a dry-chemical extinguisher is the choice tool for suppression, but for a Class-A fire, a firefighter can choose to use a dry-chemical extinguisher or a water can. A dry-chemical extinguisher does not provide cooling – only suppression. The extinguisher’s chemicals work by altering a fire’s chemical makeup in order to break the chain reaction and stop the flames from spreading, but they do not cool down the material that is already burning. I responded to a call in which a sofa chair that was on fire in a room was treated with a dry-chemical extinguisher. The fire was suppressed, but the contents of the room were still hot and I could hear the sizzling as we waited for a hoseline to be brought in. Water was still needed to cool off the objects and prevent re-ignition. This is a scenario in which a 2 1/2-gallon water extinguisher comes into play. 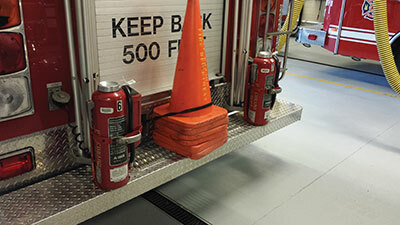 On a dedicated truck company, a water extinguisher or water can is considered standard equipment (see photo 3). When a search team enters a structure, one member is usually assigned to bring along the water can. This allows the interior crew members to conduct a search; if they come across the fire, they can control it or knock it down enough to keep it in check. Now the fire in question here is going to be a fire that can be controlled by a 2 1/2-gallon water can – we are looking at a fire in a bedroom and coming out into the hallway and making its way down the hallway. The water can has enough water in it to be able to knock back the fire in the hallway and keep the fire in the bedroom. This is where the search team can close the door to contain the fire while the search is completed. A hoseline is necessary for any medium to large fire, but for a small fire in a room or building, the water extinguisher is all that’s needed. Once a small fire is knocked down, the burning item can be taken outside and hosed off further. A water extinguisher cools off both the item and the area around the item that was burning. This suppression tactic achieves two things: fire suppression and cooling. The water can is also good for overhaul operations since it is mobile enough to be brought into small areas, or to cool down or soak hidden fires in small, confined spots. With a dry-chemical extinguisher, a firefighter cannot control the pattern that the nozzle discharges; it will discharge the powder in a straight, stream-style fashion, eventually dissipating into a dust cloud. 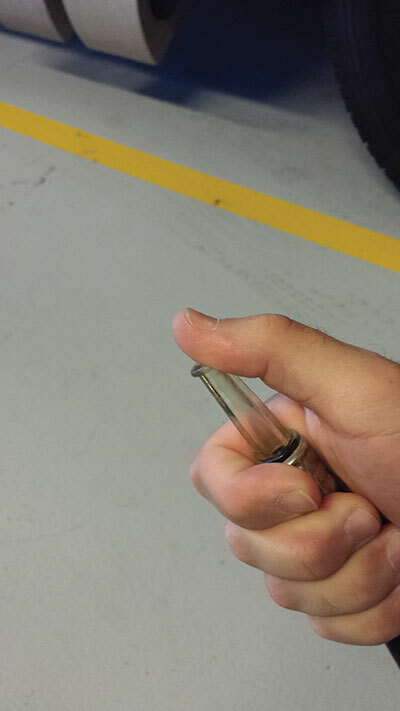 By contrast, a firefighter can manipulate the nozzle discharge pattern on a water can by using a finger or thumb (see photo 4). As with a garden hose with no nozzle, the firefighter can create a straight stream, a broken pattern, or a fog stream. This option allows the firefighter to apply the water in a way that is beneficial to the operation. The firefighter can also bank the water stream off of other objects to achieve an indirect attack. The 2 1/2-gallon water can may be a bit bulky and awkward to carry, but with practice and use, familiarity with the weight, size and height of the water can will become second nature. Knowing how long it takes to apply 2 1/2 gallons of water is also useful and will come with practice or training with the device. The next time you get a call for a small fire, a pot on the stove, or an investigation, remember to bring along a portable fire extinguisher. A well-prepared firefighter carries the extinguisher in one hand and a hand tool in the other. The Emergency Vehicle Technicians Association of Ontario (evtao.ca) is a small, non-profit member body of fire-department mechanics that oversees and helps to develop training courses that can be shared with other fire-department mechanics. With all the snow Canadians endured between November and April, it’s important to do the necessary maintenance on our apparatuses to prevent problems caused by the salt, sand and brine used on our roadways. Before I delve into this first column of a new year, I want to thank every one of you for your support over the past year. Before we get to the heart of this column, why not test your fire extinguisher knowledge? The number of firefighters killed while riding to and from calls in apparatuses has dropped over the last five years, as have the number of those who have become physically disabled and unable to return to work because of injuries from collisions. So, fall is upon us, hockey is on TV and, WAIT . . . wrong magazine. Jan. 28, 2011 – Researchers from the Fraunhofer Institute for High Frequency Physics and Radar Techniques FHR in Wachtberg, Germany, have developed a radiometer that can scan forest fires and pinpoint the heart of the flames, even when visibility is limited. ScienceDaily.com reports. The 2009 edition of NFPA 1901 Standard for Automotive Fire Apparatus has been released by NFPA. It is intended to be applied to all new fire apparatus ordered after Jan. 1. When facing an out-of-control wildfire, one entirely appropriate reaction is to pray for rain. Humankind has known this since our distant ancestors were first threatened by fire on the savannahs of Africa. We have become a lot cleverer since those early times and though it is still okay to pray, we can now make it rain by means of flying fire fighters. Seeing effectiveness of infared tool by neighbour at a mutual aid call, one Alberta department has added it to it’s toolbox. Like any department rolling into the 21st century, the Calgary fire department has seen its share of vehicles. Rescue trucks, pumpers and aerial ladder trucks are the backbone of any major municipal fire department and while there have been major advances in construction, the role of these apparatus has remained the same.